A long time ago, I read a book called Katherine, by Anya Seton. 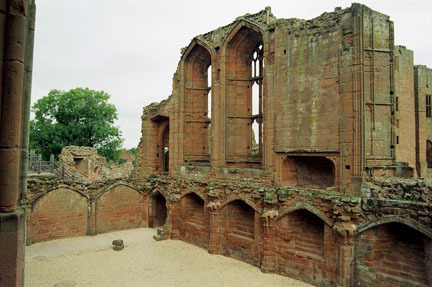 The main characters spent a lot of time at Kenilworth Castle, and I'd always wanted to visit. I was in England for a week in 1997 (before I drank all the beer in Germany). We hopped the bus at Victoria Station and went north. It's a beautiful place, and I'm glad I finally got to see it. It's built from the most beautiful red sandstone, native to the area. King John owned it, the Mortimers owned it, John of Gaunt owned it, and Elizabeth I's favorite Dudley owned it. It has quite a history. The Great Hall. It originally had a floor and the foodservice area was underneath the Hall, so the diners would get their food while it was still warm. One of the doorways into the Great Hall. One of the gates -- there's a fireplace back there. Maybe the guards kept supper on? Oliver Cromwell had the castle dynamited and shot with cannon. He thought it was too close to London and Royalists might use it as a defensive stronghold from which to launch attacks on him. This was obviously a pretty castle and I don't think much of ol' Ollie for beating it down.